June 25, 2013, Miami, FL- When a hundreds of die-hard Miami Heat fans gathered at the Shucker’s Bar and Grill on Biscayne Bay June 14th to watch their favorite team duke it out with San Antonio Spurs for a NBA title, they had no idea that they were in danger. But when the crowd jumped after the Heat scored a basket the deck gave way and at least a hundred people were plunged into the shallow waters of Biscayne Bay, leaving two people in critical condition and dozens of others injured. Now, a Miami couple has filed the first of several anticipated personal injury lawsuits against the bar. Property accidents, which are too common, rarely make national headlines, but this particular incident took place during a pivotal game in the national basketball playoffs and demonstrates how quickly a seemingly innocuous night on the town can turn tragic. The wooden deck which jutted 25 ft. onto the water collapsed in a V-shape plunging patrons, chairs and tables into the four-foot deep water. Patrons who managed to escape the fall jumped into the water and offered aide to the injured people. Emergency crews took over two dozen people to the hospital where two of the victims were listed in serious condition. Now the injury victims are beginning to question what happened and holding the bar owner accountable. The 14 page injury lawsuit, filed by Reynaldo Reyes and Flavia Guisella Ellemberger states that Shuckers Bar and Grill on North Bay Ltd., had a “duty to properly maintain its property and to warn of dangerous conditions which it had actual or constructive knowledge of… and should have taken action to remedy it,” the Miami Herald reported. The lawsuit states that following the deck collapse, Ryes and Ellemberger, suffered bodily injury and disfigurement and mental anguish. The lawsuit is seeking compensation for their medical costs and emotional distress. 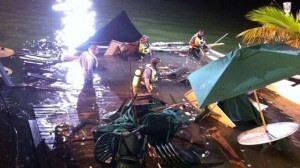 After the accident, North Bay Village Chief building inspector Raul Rodriguez conducted a visual inspection of the deck. In a June 17th press conference, Rodriguez fell short of pinpointing an exact cause of the collapse, but told reporters that the concrete surrounding the steel pilings holding up the deck appeared to be crumbling and the steel was corroded. It is unclear when the deck was built, but Rodriguez noted that there was 40 year-old certification, in which an engineer stated the “building and structure were safe,” CBS Miami reported. Rodriguez could not tell reporters what the maximum capacity of the deck was nor would he assign blame to either the bar owner or the original inspector who deemed the structure safe. Rodriguez and his office are still trying to determine the cause of this accident that harmed so many. Business owners have a duty to make certain that all of their patrons are safe, but too often people are harmed either in slip and fall accidents or because of unsound of failing structures. These accidents are by no means intentional. However, if a business owner fails in their duty to keep their employees or patrons safe from injury, they can and should be held accountable, but that often takes the legal skills of an attorney. If you have been injured in Miami business, injury attorney Jonah Wolfson will guide you through the process of obtaining compensation. Mr. Wolfson understands his client’s needs and the pain they are going through and won’t stop advocating for them until they get the settlement they deserve.